Like most U.S. airports, DEN typically uses potassium acetate for deicing critical airfield pavement. But the airport’s environmental group reached out to Field Maintenance Director Ron Charles about potassium formate, and he was immediately intrigued. “It has been in use for years in Europe primarily over acetate, but I didn’t know it was available to us,” he comments. After verifying that Alpine RF-14F, by Nachurs Alpine Solutions Industrial, is approved under AMS 1435 for use on airfield pavement, Charles agreed to give it a try. Throughout his five years at DEN, however, potassium acetate had always been the runway deicer of choice. The competitive advantage of potassium formate is that it breaks down more readily after use. According to Nachurs Alpine, its deicer requires one-third less oxygen to biodegrade in waterways than potassium acetate; so, its product has the lowest environmental impact of any commercially available runway deicer. Despite its lower chemical oxygen demand, potassium formate is considered a sister product of potassium acetate, meaning the products deliver comparable deicing results. Unfortunately, leaving behind a smaller carbon footprint isn’t the only way potassium formate is “greener” than its acetate counterpart—formate also costs about 10% more. 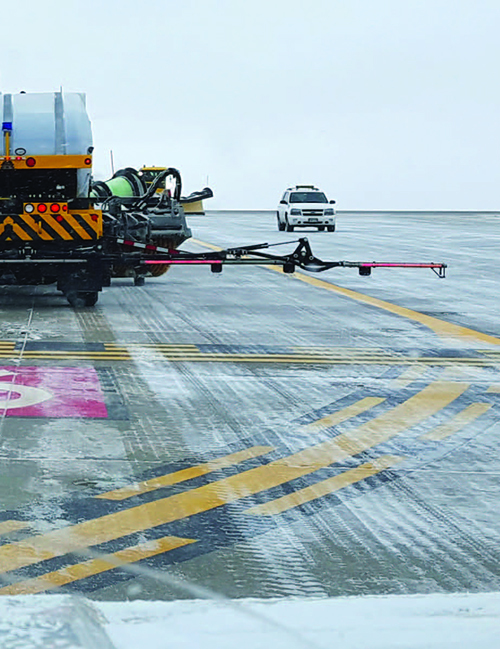 BASF partnered with DEN to compare the performance of potassium formate and potassium acetate during the airport’s snowy winter season, because it supplies the formic acid that is used to produce potassium formate for the alternative deicing product. Charles expected the formate and acetate to deliver comparable results, and he was not disappointed when testing concluded in February 2018. Field maintenance crews emptied the acetate from one of DEN’s 4,000-gallon chemical trucks and filled it with formate, so they would be ready to apply the alternative deicer during the next snow event. 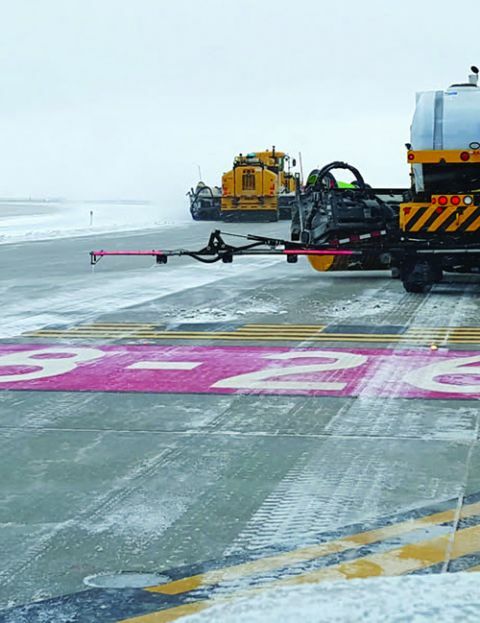 When the airport received 2 to 3 inches of accumulation, crews applied acetate to one of DEN’s six runways and formate to an adjacent taxiway. Charles explains that it was important to choose pavements that were near one another (vs. two runways or two taxiways that were farther apart), because DEN’s airfield is so large that various sections can experience surprisingly different weather conditions at the same time. Before applying the deicing materials, crews followed their usual strategy of first clearing the runway and taxiway with plows and blast-brooms, and then spreading sand in an 80-foot-wide swath on the exposed pavement. They then applied an 80-foot-wide swath of each deicing product. Liquid deicer not only causes a chemical reaction, but also wets the sand, which helps hold it in place and improve traction, notes Charles. “We basically applied the products side-by-side to see how the potassium acetate holdover time on the runway compared to the potassium formate holdover time on the taxiway connected to that runway,” he explains. Crews measured the results by monitoring takeoffs and landings, and using operations vehicles to perform friction tests on the runway and taxiway surfaces. The tower also received reports from arriving flight crews categorizing the braking action as “good,” “fair” or “poor.” When conditions were reported as “fair,” maintenance crews were scheduled to add more deicing chemicals to the surfaces. If conditions were deemed “poor,” crews were deployed immediately to improve conditions. The potassium acetate DEN currently uses meets the airport’s environmental goals. It is non-corrosive to machinery and airfield pavement. Maintenance crews do not have to perform cleanup procedures after applying it, and once it’s diluted, it is environmentally stable. But potassium formate provides comparable results with less environmental impact; so DEN will consider using it in the future. Due to the smaller footprint that potassium formate leaves on the environment, DEN will accept bids from its vendors for both potassium formate and acetate for use during the upcoming winter. However, since DEN is run by a municipality, price is king. The vendor with the lowest bid will win the airport’s two- to five-year contract—no matter which type of approved deicer it sells. Given the high volume of deicer DEN purchases (about 400,000 gallons per year), it could actually help bring down the price of potassium formate in the United States if the busy airport makes the switch, muses Charles. Naturally, it all depends on which vendor wins the contract. BASF is conducting deicing trials at a handful of U.S. airports. Morristown Municipal, in New Jersey, tested potassium formate on its runways in 2016 and has continued to use it since the trial. According to Glowacki, the trials at DEN and other locations proved exactly what BASF expected, giving the company more evidence about its product’s performance and environmental advantages.